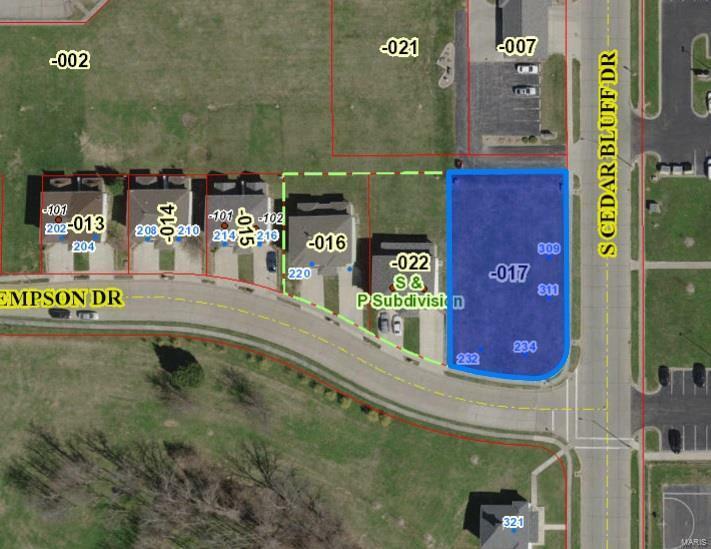 Large corner lot in S & P subdivision zoned for Multi-Family. Road frontage on both Empson and S. Cedar. Addresses 232 and 234 Empson and 309 and 311 S. Cedar Bluff in Valmeyer. Great location and fantastic investment opportunity. Build the villa/condo of your dreams and rent the rest out or build for investment potential. Water, sewer, electric and gas available at property. Tap in fees for sewer and water have already been paid. Lots of possibilities in a quiet rural environment with easy access to surrounding communities and St. Louis.